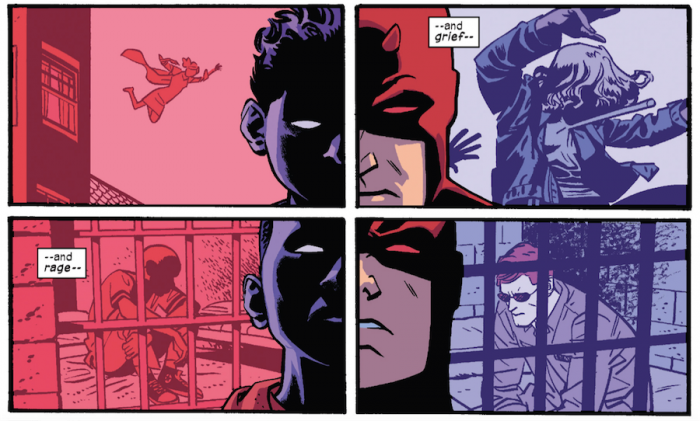 In Daredevil #9, storytellers Waid and Samnee skillfully add a new layer to the Purple Man’s mythos by setting up his children as a new and different threat to Daredevil. As anyone familiar with Matt’s history with Killgrave will know, the former’s blindness makes him partially immune to the latter’s powers of persuasion. Not completely immune, mind you, but able to resist by sheer force of will. At least part of Purple Man’s power depends on his puppets being visually exposed to his purple skin. His children, however, are different. And, as we are about to find out, potentially much better at wreaking havoc simply by showing up. In addition to their powers being somewhat enhanced, in ways that spell disaster for our favorite blind superhero, they lack their father’s calculated control. They’re kids, and they act like it. They want what they want when they want it, and are prone to sudden changes in moods and desires. These moods affects those around them, and Matt is not immune. Before Daredevil has his run-in with the Purple Children, we check in with Matt who is on his way to breakfast with Kirsten and a poorly disguised Foggy Nelson. There is much to enjoy in this scene. It is charming, and Samnee generally nails the art (the level of detail, from the pattern on Kirsten’s blazer to the city in the background, is incredible). It also features an interesting exchange between Foggy and Matt, where Foggy expresses concern about Matt’s ability to revisit his past without being dragged down. These couple of panels are important in light of what happens later in the issue. However, for all its qualities, I must admit to taking issue with two things happening in this scene. First of all, I don’t believe for a second that Matt is a poor writer. I will buy that he doesn’t usually have the patience for it, so the suggestion that his style is, as Kirsten puts it, “terse” doesn’t bother me (and her way of expressing it is certainly clever). But Matt Murdock is someone who, as a kid, was forced to spend much of his free time studying. For years. He then went on to be a top student at a prestigious university with a presumably spotless academic record. He’s never given any indication that he’s anything but well-read and well-rounded. I’m not suggesting that people who may be dyslexic – to mention one reason someone would have specific issues with writing – can’t be lawyers or generally brilliant, but Matt isn’t dyslexic. Why would he be failing at basic spelling and punctuation? The one thing I might go along with is that his lack of patience combined with his blindness (let’s say he’s turned off the voice feedback from his keyboard while typing, is a sloppy typist, and can’t be bothered to listen back through his own writing for typos after the fact) might result in subpar writing on a day to day basis, especially if he knows it will be checked by an assistant on the way to its final destination. But that he couldn’t do better than that if he tried? No, that makes no sense to me at all. And we actually have proof that his writing is fine. There is also another aspect of this scene that makes it a little too cartoonish to mesh perfectly with this particular storyline, which is otherwise quite dark. In one panel, Matt appears to be pulling out his advance check for the book deal he was offered last issue, only to have Foggy discover that it’s a dry cleaning receipt. This, in and of itself, is funny. But Matt’s big “Aha! I’ll show you!” feels over the top to me, and in what is a very rare misstep on Samnee’s part, even his expression looks somewhat exaggerated. It feels like Waid and Samnee both are trying a little too hard to be funny throughout these two pages. I wish they’d reigned it in just a tad, especially since Foggy’s appearance is already farcical enough. Having said that, there is definitely a clear point to this particular chapter of the story, and it gets back on track as soon as the trio enter a diner and Matt realizes that there’s is a commotion nearby. His costume change is a fun twist on an old classic and Daredevil’s first meeting with the Purple Children, then behind the wheel of a police car, is very well-conceived and illustrated. This issue was an unusually fast read for me, and it’s not due to poor pacing. Quite the contrary. The last half of the issue has a frantic feel to it that makes it a real page-turner. Chris Samnnee’s line art, beautifully layered with Matt Wilson’s colors paint a perfect picture of chaos. The pages are dripping with adrenalin and confusion, much of it Daredevil’s as he’s trying to make sense of the situation. He knows that Purple Man is active in San Francisco, and gradually realizes that the strange children he’s encountered are connected to him, but he obviously can’t see their purple skin. One of the more interesting things about the Purple Children, that sets them apart from their father, is that they make for much more sympathetic villains. The children are themselves victims of their father’s sadistic machinations and they are clearly still feeling and expressing normal human emotions. They’ve come to rely on each other and will fiercely defend their siblings from attack, whether real of perceived. They also appear to be passing in and out of “purple mode,” as evident in the clever lettering of Joe Caramagna. Caramagna has been doing a fantastic job on Daredevil for years now, and it’s always nice to see an issue where his skills are on display to the extent that we see in this issue. Nowhere is the victim status of these children more evident than in the way their experiences echo those of Matt Murdock. One page is split down the middle to showcase the past struggles of each of the five children and how they compare to past events in Matt’s life. Not only is this page beautiful to look at, with its clever use of contrasting background colors, it is also quite heartbreaking. This story arc will reach its conclusion in the next issue, but with Daredevil #9, the creative team set things in motion that promise to have ramifications beyond the scope of this particular story. It has been suggested since Mark Waid’s first issue on the title, over three years ago, that Matt is actively trying to bury things. Away from the children, Matt’s complete despair might lift, but the fact that he’s been forced to confront these emotions, all at once, is sure to leave its mark. I’m very much looking forward to what next issue has in store. I agree with your quibbles. I THINK I have a way to make the first sit better with me, and it’s partly informed by personal experience and extrapolation. My handwriting is abysmal. Print is barely legible and cursive might have been except that when I was in elementary school and we were expected to use cursive, I was asked to print (and, for longer papers, have my mother type them; I took a typing course as soon as I finished high school). So, my cursive writing skills pretty much atrophied (until I got to college and started taking Russian. And then, I had a new problem which is not germane to this post, but suffice to say that I cannot write cursive today without Cyrillic creeping in). Correct me if I’m wrong, but there’s never been any indication that Matt attended a school for the blind full-time. Maybe there was some part-time assistance, but it seems as if he was mainstreamed early on. If this is the case… and if he was the only blind student in his class (seems likely), it is possible that his teachers asked him to submit his homework on audio-cassette, tested him orally, etc. Writing skills can fall into disuse. (After years of working behind a keyboard, my handwriting is far less legible than it was when I was in high school, and I still do write a few things by hand… shopping lists, for example. My cursive is a lost cause. Yes, if I sit down and really concentrate and focus, I can do it but… it takes forever and I get impatient and… sigh. If college considered audiotapes and oral testing to be “fair and reasonable accommodation,” it’s not that unreasonable that his writing skills could have declined to sub-par levels. Especially since Matt isn’t fresh out high school anymore. Meanwhile, his verbal brilliance carries him through with flying colors. So, when he has to sit and write, he does, but (as you suggested), he gets impatient, he can’t be bothered, his brain is several pages ahead, while his fingers are struggling to catch up (making more and more typos in their haste to do so) and since Foggy and Kirsten only have the final result to judge by… well, they’re telling the truth as they know it. But if Matt is trying to communicate with the woman he still loves deeply… it’s believable that he’d take those extra pains to make every letter perfect, even if he needs to go through several drafts to do it! All other points aside, I LOVED this issue and it is going to be a rough few weeks sitting on tenterhooks waiting for the next one! I dunno, I had no problem with the book deal conversation. Three friends walkin’ and talkin’…in my opinion it’s not necessary to take their words as gospel. People exaggerate for effect or comedy when they talk. Foggy and Kirsten are clearly ribbing Matt a little, what with the “dropped on his head at an early age”. Kirsten even states that her real point is just that Matt seems to write like someone who would rather be doing something else. …And in turn, Matt’s big theatrical “A-ha!” is just him giving it back a little. The thing with the whole “bad writer”-thing to me seems to do more with his subject matter the his inherent abilities. It’s possible that he may be a good writer, but is horrible at writing about himself, which is the case with most people in real life. Also, writing college essays, newspaper articles, or court briefings is much different from narrative. Also, I can see Matt being bad at spelling/grammer/punctuation/etc, just from the pure time constraints of being DD. I know this is comics, but Matt (along with every other superhero, particularly Batman and Spiderman) is depicted as virtually working an eight hour (often longer) job with maybe another eight or so hours DD’ing, plus fitting in social stuff & sleep. I can see him being a bit sloppy and rushed with writing due to time/attention constraints. Seriously, how many times have we seen Matt wing it in the courtroom because he’s been too busy Daredevil-ing? Only problem I had was the black kid just had to be the one who was in jail. Thanks, Mark Waid. Solid issue. But not as great as it could be. 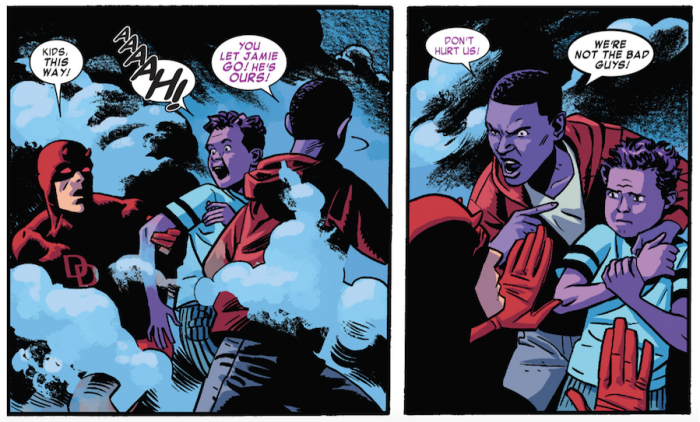 The Purple Children are great and the scenes with them and Daredevil are amazing. As usual the issue is brought down be the attempts at humor. The scene between Matt, Foggy, and Kirsten were just awkward and not funny. The jokes fall flat. I get that Matt is in denial and Foggy has cancer and they are probably coping and Matt is acting out of character because of that. I’d be seriously happy if we could get past that and Matt start acting normal again. All three of the main cast come across like immature twits way too often. Kirsten is Waid’s own creation so if he wants her to be a twit thats fine. Matt and Foggy need to start acting and speaking like professional grown men again. Also to anyone who isn’t following She-Hulk, the best Daredevil story in 18 months is currently happening in the pages of She-Hulk. Blows Waid’s past year out of the water. @Isaac, For me, the nadir of the Nocenti run (and I haven’t read much of it, I admit; just what’s available on Comixology and Marvel Unlimited) was #260. A double-sized issue featuring… DD getting slowly beaten to a pulp and left for dead. Double-sized! Although seeing DD fall off the bridge in the current issue did bring 260 to mind and leave me wondering if it was a subtler flashback to a less-iconic low point. I really enjoyed this issue. The middle bit between Matt, Foggy and Karen was a bit uneven, but I was never taken out of the situation. I was glad to see Foggy back, he’d been missing for a few issues and I was starting to wonder when he would return. The current team has gotten some flak in their handling of Foggy this year, especially considering the big cancer reveal in 2013. There has been some criticism in the handling of this particular thread, mainly that it hasn’t received the kind of attention that this (admittedly very serious) situation has warranted. I’m no apologist, I think this current run has had some bumpy spots, but the good far outweighs the bad for me and I’m confident that the storytellers will do right by the characters. I’ve stated elsewhere that I feel that Waid, Samnee and co. have gotten some unfair criticism from some fans, and that while I can understand what they dislike about the run, (as a longtime DD fan myself) I think this is one of the best runs that the book has ever had and I’m eager to see where it goes. The Purple Children are fantastic creations and I love how they are being used. The 10 panel page correlating DD with each child is one of the best pages I have ever seen in any comic because of the simple but perfect way it conveys it’s ideas. And yes, the panel of the boy in jail is unsettling, but I also think that it was a deliberate choice on the part of the creators and that their intentions in using it were not sinister. I think this particular boy has ,on occasion, been abused by the system because of his ethnicity and not in spite of it. I’m very excited for how this story wraps up and what it’s future implications could be. Haven’t read the new She-Hulk yet, but I’ve been following that series off-and-on and am sad to see it go. Let me also say, that I’m planning on checking out at least the first part of this Superior Iron Man thing, but the prospect doesn’t entice me. I can only hope (well I hope it’s good and that my assumptions are wrong – at least if this crosses over into the DD title) that the Owl and his new powers don’t factor into it. He’s always been my favorite DD baddie, though I will admit he’s probably never a particularly well defined character in his 50+ years in the books. @Isaac Ты писаешь по-английскй лучше чем я по-русский или по-испанский 😉 (It’s been a couple of decades since I studied either and I still needed an on-line dictionary to check three words in that sentence… But yeah, based on the few Nocenti comics I’ve found, I have to agree with you. The dialogue is pretty stilted in English too. Осторожно, правильная форма от глагола писать (с ударением на -ать) – это “пишешь”. А “писаешь” это совсем от другого глаголла, который пишется одинаково, но произносится с ударением на “пи”. Это по-английски значит “to piss”. LOL! Ooops. I studied it for 3 1/2 years in college, but I’ve forgotten a lot. Something I noticed on a second read that I wanted to bring up. On the awesome page (Samnee is a treasure) with the 10 panels showing the reflections/parallels of Matt and The Children’s pains. I find it funny that the top pair showing on one side the young girl being struck by what can only be assumed to be a parent, is paired with Matt getting punched by a villain. I would think the much more appropriate, albeit obvious, moment to show would be Matt getting hit by his father. Of course this immediately brought to mind the recent “Original Sin” story that I’ve been trying desperately to forget (seriously, what garbage), where apparently Mark Waid is trying to rewrite Daredevil’s established history to remove any abuse from his father.